Are All Skydiving Locations The Same? Looking for places to go skydiving in GA? There are lots of skydiving locations to choose from. But before you book… be aware: not all skydiving centers are the same! They differ in many ways, from their affiliation with the United States Parachute Association to the aircraft they use. Here, we’ll explore what differs between skydiving locations and what to look out for when making your choice. The USPA, or United States Parachute Association, is the governing body for the sport of skydiving in the US. USPA member drop zones abide by the rules and guidelines put in place by the USPA. These guidelines are intended to negate risk as much as possible and provide a framework for qualifications and progression within the sport. USPA member skydiving centers use USPA qualified instructors, which means those instructors have been through a rigorous training and assessment process. For first time skydivers in particular, USPA membership is reassuring and proves a certain level of quality in the skydiving center. For more experienced skydivers, using a USPA center and becoming USPA qualified themselves means they have a skydiving license that can be used globally, too. Skydive Monroe is a USPA member drop zone. Find the full list of USPA drop zones. Another differentiating factor when choosing a place to skydive is the aircraft they use. 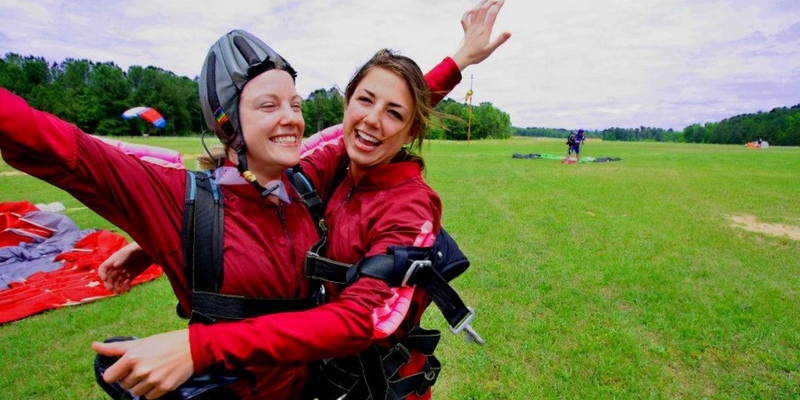 Skydivers are, generally, pretty happy to jump out of any aircraft (so long as it’s safe). It’s a common joke to talk about ‘jumping from a perfectly good airplane’ and to respond with ‘you think our airplane’s perfectly good?!’. Skydiving aircraft today, particularly those at USPA drop zones, are really well maintained and vary from small planes that take just a few people to much larger aircraft that carry more than 20 skydivers to altitude. Some airplanes have side doors, some rear doors. Sometimes, we jump out of helicopters or hot air balloons. Your skydiving location you choose may be influenced by the aircraft they use. For example, here at Skydive Monroe, we use a King Air, which is known as one of the fastest and most comfortable skydiving planes around. Skydiving attracts a certain type of person. We’re all fuelled by adrenaline, love to do something different and enjoy the thrill of the jump! We’re also a super friendly bunch. As a skydiver – whether it’s your first time or your 1,000th – you’ll be part of a global community of people who love the sport. It’s a very welcoming community and one in which you’ll find friends for life. Of course, every drop zone has different people and you may find you feel more comfortable at one location over another. Don’t be afraid to call or visit ahead of your planned jump to get to know people and get a feel for the local vibe. It’s also important to look at the experience of the staff, especially if you’re jumping for the first time or learning to skydive. Here at Skydive Monroe, we’re really proud to have a team of highly experienced instructors who absolutely love what they do – and they’re here to make sure you enjoy it too! Ready to skydive Georgia with our highly experienced team? If you’d like to learn more about what makes us different, get in touch or book your tandem skydive with us today.